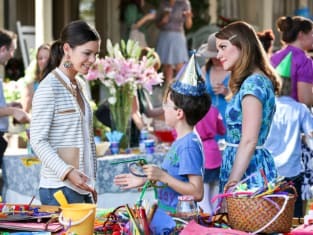 My heart broke for Zoe Hart on Hart of Dixie Season 3 Episode 6, as she discovered a family she never knew she had and something she had always desired... but the feeling wasn't mutual. I have high hopes for this season and this hour kept those hopes alive. 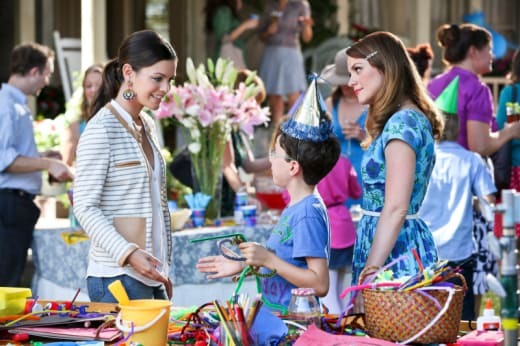 The worst part about Hart of Dixie Season 3 is Linley. Her obsession with George is on my last nerve. I really hope she leaves soon. That said, I am so disappointed in George. SO DISAPPOINTED! I cannot believe that he and Linley got together. This is terrible. Disgusting. What is he doing and why am I suppose to care about this??!? The addition of the movie Dolphin Tale did have me laughing, having seen that film and having nieces with whom I've had to watch it over and over and over again. Family is everything! I will say that the best part of each episode is Kaitlyn Black and Jaime King as AB and Lemon, respectively, whether they are on screen together or solo. Black has a huge grasp on her role of AB and I love having episodes that she actually has something to do that doesn't revolve around Lavon. I also loved her parents wearing Lavon's jersey. I definitely had some laughs with this. Also, Lavon, you're an idiot. That woman loves you and, quite frankly, you can't do much better than AB. This is another look into the naive world of Lavon Hayes. Lemon, well, you know that I love Lemon and any kind of plot that is thrown her way; she is just fantastic. I am glad that she didn't take the job at Fancy's - she isn't fancy anymore. I really hope she finds her way - I look forward to following her story until she does. Overall, I enjoyed tonight's episode. The addition of AB parents was delightful. Sadly, for Zoe's sake, her "family" rejected her and my heart just broke for her. She deserves a caring family. In the end, Joel still has my heart because he is adorable, Wade is back to being a whore - and I ended the hour with a smile.